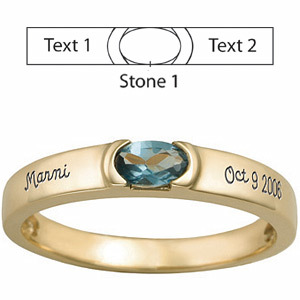 Choose your stone, metal and engravings to create a personalized item. The Halo ring's clean, simple lines provide an elegant background for one 5x3mm oval stone and two engraving areas. Engrave up to 12 characters in each engraving area. Choose 10kt or 14kt, yellow or white gold. This stackable ring is available with simulated or genuine birthstones. Import.